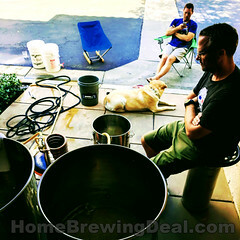 Coupon Description: MoreBeer.com currently has a coupon code for a $30.95 Home Brewing Whirlpooling Arm. This stainless steel homebrewing whirlpool arm is designed for installation underneath the handle of your homebrew kettle. this piece of stainless steel home brewing equipment will allow you to achieve a perfect whirlpool in your Boil Kettle. Simply pump your wort from your ball valve, into this piece, which will jet around the inside of the kettle, forming a strong whirlpool. The advantages to a whirlpool are many. 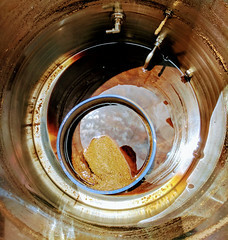 It will settle Trub in the center of your kettle, making it easy to pull clear wort from your ball valve. The whirlpool will result in a much higher chilling efficiency if using an immersion chiller, due to the increased turbulation of wort. On top of this, the increased flow will result in higher extraction of hop oils and flavor during flameout additions! This homebrewing spigot is made of stainless steel, ensuring it will be used in your brewing for years to come. It features a 1/2″ Full Port ball valve and a 1/2″ barb. The inner barbed elbow is 3/8″. The bulkhead is a specifically engineered piece of stainless, made for brewing! It features a 1/2″ MPT outlet for hooking up your ball valve directly, along with FPT on the inside for connection of any brewing accessory you might want. Coupon Description: MoreBeer.com currently has a Homebrewing Coupon Code a 2000 ML Flask for $14.99. This large 2000 ml Erlenmyer Flask is the ideal vessel to make a large yeast starter for high gravity home brewed beer. It is made from borosilicate glass, so you can move it from a boil on your gas stove into a cold water bath for cooling, without the risk of cracking. This means you can do the whole process in one container, keeping it simple and helping to reduce the risk of contamination when transferring from one container to another. 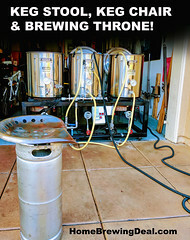 Coupon Description: MoreBeer.com currently has a coupon code for a 40 Plate Wort Chiller. 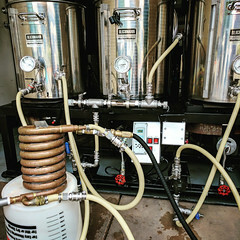 This wort chiller will cool your wort to the perfect low temperature to get the best cold break possible, and getting your wort to the ideal pitching temperature on the first pass. Equipped with a 1/2 inch MPT wort inlet and outlet to match up to the most common size of home brewery hoses, as well as a 3/4 inch MPT water inlet and outlet for easy connection to garden hose fittings. It measures approximately 8.25 inches long, 4 inches high and 3 inches wide. Coupon Description: MoreBeer.com currently has a coupon code for a $11.99 16 oz Container of StarSan. Star San is an acid based home brewing sanitizer that is quick acting, odorless, tasteless and safe for most materials. Use of 1 oz of StarSan sanitizer per 5 gallons of water and a contact time of 1 minute. As a high foaming homebrew sanitizer, Star San’s foaming action insures coverage and contact time in larger vessels and better penetration into hard to reach areas. Foam that is left over in your carboy or keg will not harm your beer or you, and is perfectly safe and non-toxic, nor will it impart any flavors or odors. These are used 15.5 Homebreing keggles with welded couplings. These half barrel brew kettles are great for all grain home brewing setups. Each of these homebrew kettles are acid dipped to clean after top cut out.